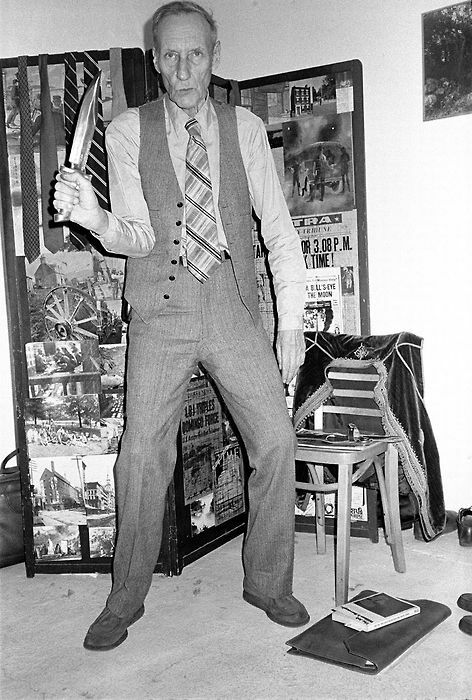 The only photographs of Burroughs I despise more than those of Burroughs with rock stars are the pictures of Burroughs with guns. Well, maybe that is not quite true. There might be a worse set of images but we will get to those shots later. In any case, guns are so much a part of the Burroughs image that they cannot be ignored. For some people, these are the iconic images of Burroughs. They define the man. For some, the image of Burroughs blasting away at a target in Lawrence is treated as comic relief. Let’s get the old coot blitzed on vodka and cokes and set him loose on some paint cans!! The same goes for the pix of Burroughs wielding a knife or sword attacking imaginary assailants with a look of near idiocy. The scenes of Ginsberg and Burroughs at the firing range in Don’t Hide the Madness are pure slapstick, like an old-timey vaudeville routine. Burroughs could have written it up himself. 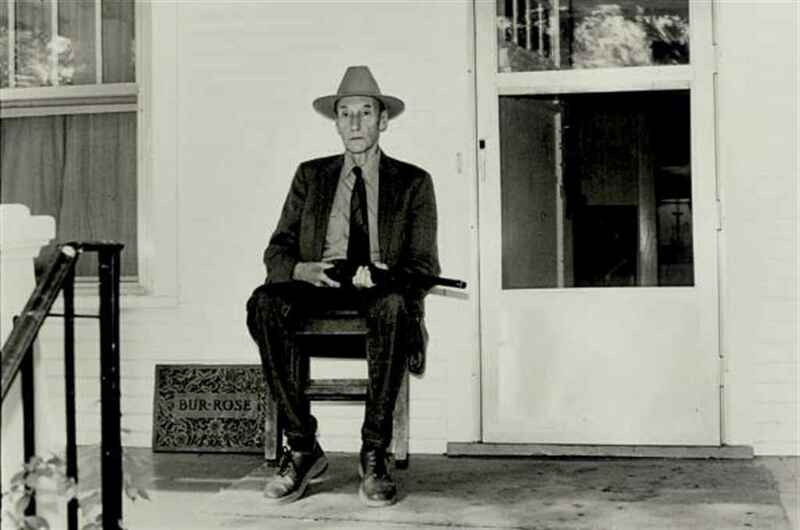 I find Kate Simon’s photograph of Burroughs on the front porch in Lawrence with a gun resting on his lap to be pure comedy. I do not know if it was intentional on Simon’s part, but Simon is a fantastic photographer who captured some of the most iconic pics of punk. She knows what she is doing. Is this just a pic of Burroughs in his natural habitat? Home, home on the range. The old folk’s home that is. Or is there something more? For Simon a photograph is all about the eyes. Simon: “The eyes provide the whole barometer of a person’s status. To me, without [eye contact] you ain’t got a picture.” What to make of Burroughs’ vacant stare here. For me Burroughs’ eyes make him look like a character out of his own novels. The County Clerk to be exact. This is Burroughs at the Old Court House in Pigeon Hole outside of the urban zone. “The inhabitants of this town and the surrounding area of swamps and heavy timber are people of such great stupidity and such barbarous practices that the Administration has seen fit to quarantine them in a reservation surrounded by a radioactive wall of iron bricks.” Burroughs’ eyes look stupid here. “The County Clerk often spent weeks in the privy living on scorpions and Montgomery Ward catalogues.” You half expect Burroughs to point the gun at you and tell you to get off his lawn or ask you with an air of menace what your intentions are with his granddaughters. A shotgun wedding does not seem out of the question. I should not laugh as Burroughs could equally well stomp off the porch and lead a public burning. No, there is nothing funny about Burroughs and guns. Every time I see these photographs, particularly when Burroughs handles a small firearm, I flash to the pic of Joan Vollmer on the coroner’s table. I find it hard to believe that Burroughs did not do the same whenever he squeezed the trigger. Yet if Burroughs could do anything, he could compartmentalize. Burroughs with a gun is the very image of the Ugly Spirit. There are precious few images of Joan and nearly all of them have an air of tragedy about them. The mugshot for example or the one of Joan on the streets of New York City clutching a paper bag for dear life with her eyes shut. It seems to me there must be a bottle of vodka or a box of bennie inhalers in that bag. I wonder if she was heading to a party. Or just drinking alone. The contents of the bag remind me of the picture of the table littered with the dead soldiers of a wild party taken after Joan was shot above the Bounty Bar. There is no image of Joan with a shot glass balanced on her head. I would gather that once again her eyes were shut for dear life. There is only one photograph of Burroughs with a gun that matters and it is powerful stuff, if not treasonous. 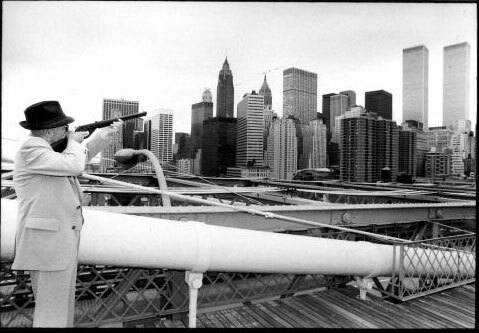 Gerard Malanga’s 1978 photograph of Burroughs taking aim at the Twin Towers from the Brooklyn Bridge. This ranks up there with the dust jacket of Don DeLillo’s Underworld as one of the more discomforting and prophetic photographs of the Twin Towers pre-9/11. Besides being Andy Warhol’s right-hand man at the Factory and a master of silkscreening, Malanga is a fine poet and an accomplished photographer. He took quite a few iconic photos of Burroughs and the other Beats. We will see another Malanga photo of Burroughs later. But this photograph is Malanga’s most startling. It leaves the viewer uneasy and is in some respects too hot to handle. The Ohio State University publication of The Revised Boy Scout Manual used a series of photographs of Burroughs firing a gun on the cover — rightfully so given that The Manual is a treatise on revolutionary tactics. To get the full import of Burroughs’ intention of government overthrow and terrorism, Malanga’s photograph seems more on point. But that would be stating Burroughs’ premises too clearly and akin to being struck with a blunt instrument. Ohio State wanted to have their bibliographic cake and eat it too without leaving too much of a bad taste in one’s mouth. Thus the book’s publication by a university press instead of a samizdat format like The Anarchist’s Cookbook and the cushion of unnecessary and unhelpful scholarly paratext to soften the blow. Or more likely to smother the text into silence. Written by Jed Birmingham and published by RealityStudio on 14 April 2019.